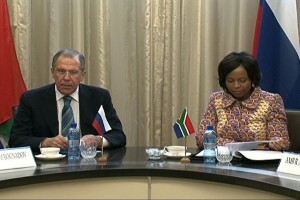 Sergey Lavrov, the Russian Foreign Minister, concluded the second leg of his Africa tour in South Africa yesterday before flying to Mozambique. In the capital Pretoria, Lavrov told his South African counterpart Maite Nkoana-Mashabane that Moscow would embark on an initiative to bolster business and political ties with the continent. Lavrov said that Moscow was particularly interested in increasing trade with fellow BRICS member South Africa ahead of a summit bringing Brazil, Russia, India, China and South Africa together in Durban at the end of March. “Our challenge and priority is to focus our attention and resources on critical priorities, concrete projects and instruments that will enhance our economic relations and technical co-operation,” Nkoana-Mashabane said on Tuesday. Nkoana-Mashabane alluded to her country’s low level of exchanges with Russia, an erstwhile ally to the Africa National Congress during its struggle against Apartheid in the 1970s and 80s. “There is scope for substantive and mutually beneficial cooperation arising from these Agreements in the fields of agriculture, forestry and fisheries, arts and culture, defence and defence industrial cooperation, education and skills development, energy, fighting crime and corruption, mining and mineral resource beneficiation, science and technology, transport, trade, investment and banking, tourism, which will enhance our commercial relations,” she said in a statement following Lavrov’s visit. Nkoana-Mashabane and her Russian counterpart also discussed the upcoming visit of President Vladimir Putin to Pretoria next month. She said the planned trip was an important milestone for both countries to meet commitments made during previous state visits. The Russian foreign minister also discussed the security situation in Algeria and Mali, adding that African countries and institutions should resolve these issues without asking for external military intervention.